Though that bulky yarn makes it less suitable for everyday wearing (it's warm! ), it does make for a quick knit. I finished my sweater dress last Thursday. I love it. Some of you already commented about the colors. Yes, neutral, but not boring. That's why I love it so much (I made cowls with it before and knew I wanted a sweater in that colorway). The cowl neck turned out a bit tighter than I was going for, but when I tried it on, I liked it, so I kept it that way. The length is just right, a few inches above my knee. I know that in the picture it seems somewhat tight on me, but it does look good in person (so hard to take pictures of oneself). Also I lost a lot of weight lately and I hope to loose a bit more, so I like that it will still fit then. Overall, I'm quite please with it. Knit with Marl Wool from Zeeman (but I think they don't sell it anymore, can't find it online), no pattern but some help from Elizabeth Zimmerman on the yoke and the back neck short rows. Knitting: I'm at the last part of the yoke of my sweater. I've been trying it on and it's tight, but it does fit. Now I'm guestimating how to make a wide turtleneck (is that the right way to explain this? I want something that looks like a cowl on a sweater) with a little help from Elizabeth Zimmermann (Knitting without tears, I love that book). Reading: Peter Tremayne, The Leper's bell. My father loves these historic mysteries and keeps recommending them to me. This is the second one I'm reading and I'm still not sure if I share his opinion. I like the historic information that is added throughout the book (it's set in Ireland in the Early Middle Ages), but sometimes it feels like it doesn't really add to the story, but instead holds it up. Also I miss a feeling of connection to the main character. She doesn't feel real to me. But then again, it's quite entertaining. I am curious who stole the baby and why, so I'm sure I will finish it. I used to love Amanda's "This moment" posts and be equally frustrated with them, as I never seemed to be able to catch a moment like she would. When I took this picture a few hours ago I was thinking this would be a good one to share on the blog. A moment! I thought excited. And I wondered if I could revive the Friday moment posts and... And then I realized it was not really a moment again. It is a snapshot of my life right now though. So that's what I'll call this. A snapshot. Knitting: a sweater for me. A not too baggy, but comfy and long sweater to go with leggings or skinny jeans. At least, that's the plan. The first try was from a pattern I used before, but it turned out way too big (my fault: I thought using thicker yarn and bigger needles in size XS would work, but it didn't), so I frogged that. This is the second try, winging my own pattern like I did with the purple and white sweater last year, but it seems a bit small. It does fit over my hips, so that's a good start, I guess. Reading: I don't really feel up to any difficult reading lately, so I picked up a teenage favorite of mine. It's from a Dutch writer, written in the 1930's and I don't think it was ever translated, but I love it. It's 80 years old, but still very fun to read and actually quite relatable. I guess people didn't really change that much, despite television and internet. 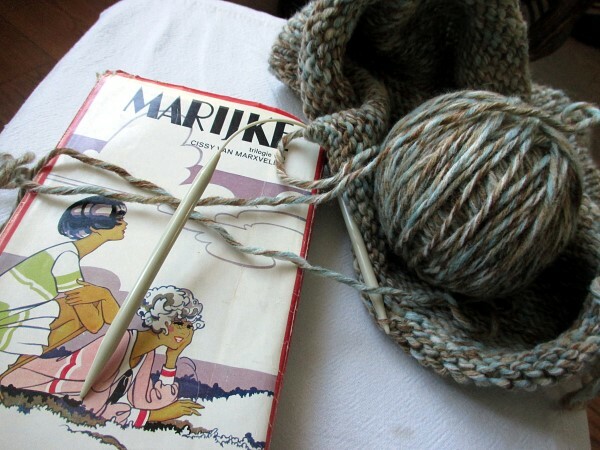 So what are you knitting (making) and reading? Well, so much for picking up blogging again.